My son’s birthday party is coming up next month. Our theme for this year is Halloween! 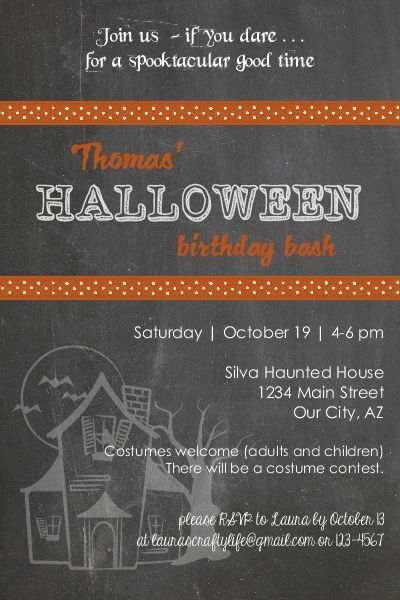 Planning this party is going to be so much fun! I don’t know why we never thought of this before, but his birthday is mid-October. So, a Halloween theme works perfectly. I used a digital chalkboard paper for the background. (I downloaded this one from How to Nest for Less.) The orange ribbons came with my software program. The haunted house in the background is from a ding bat font called Trick or Treat. I lowered the opacity to 25% on the house to allow the text to stand out. I printed them out at Sam’s Club on 4 x 6 paper. I do this almost every year for invitations. I can make custom invitations for a lot of people without having to create each one by hand. Disclosure: I am a Share the Memories affiliate, which means if you purchase the My Memories software using my code I receive a commission. I love and use this product myself and all opinions are my own!